How large can pumpkins grow? Are they a fruit or vegetable? What are some different ways we eat pumpkin? 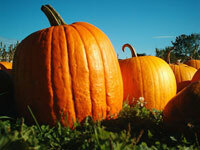 Answer these questions and much more with our fun pumpkin facts for kids!